Sure, you’ve tried a few specialties at your local Greek restaurant and watched My Big Fat Greek Wedding (both of them!). 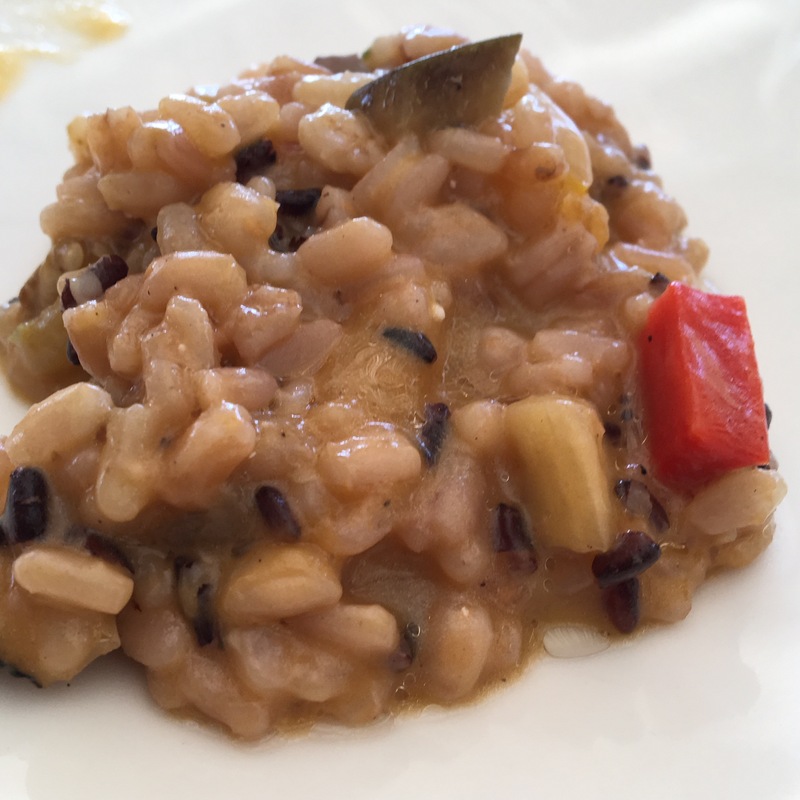 But what is Greek cuisine? 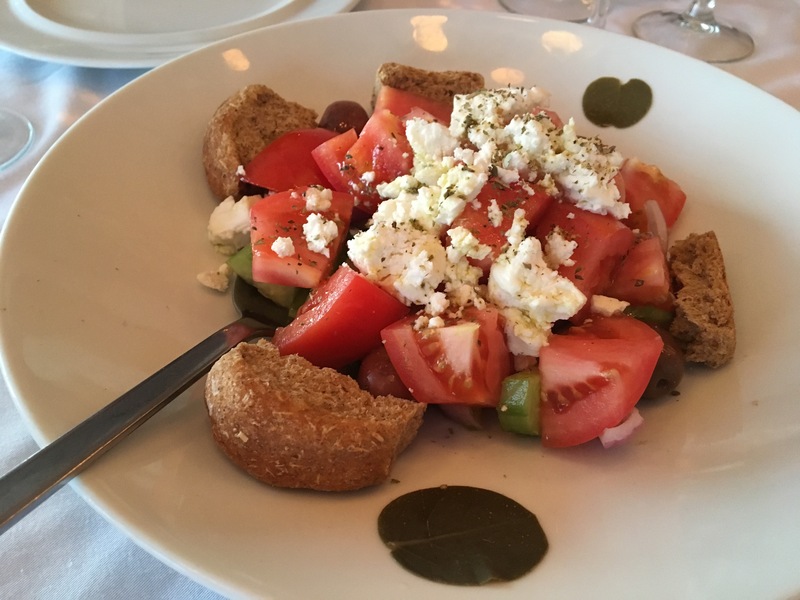 Join me on a the first in a series marking a culinary tour of Mykonos (Mikonos), one of the Cycladic Islands. 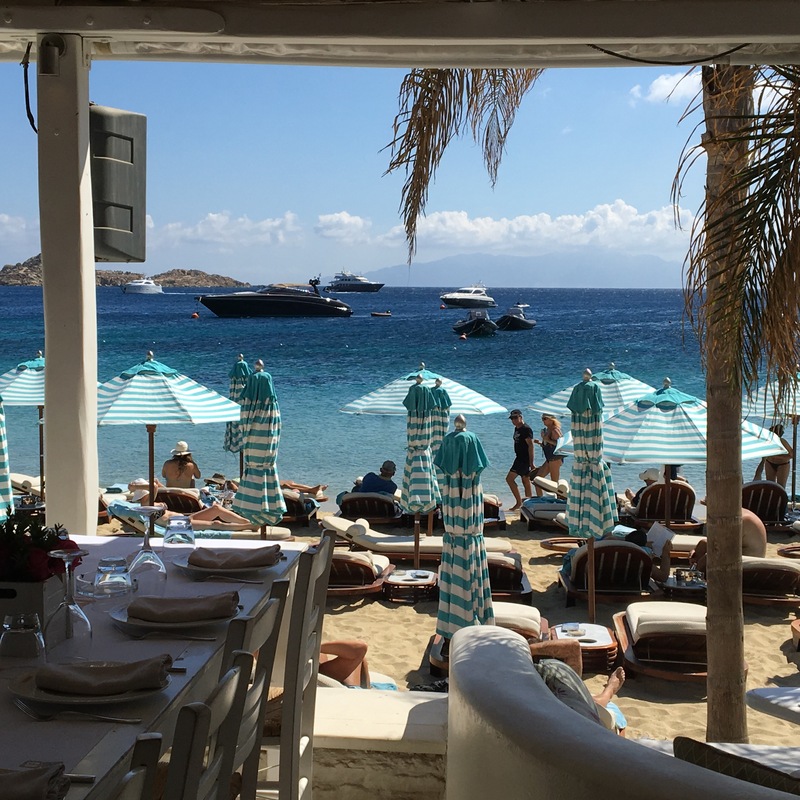 In the next few weeks, I’ll profile some of the great dining experiences in Mykonos – some suitable for most travelers, and a few for those foodies willing to splurge for a good meal. 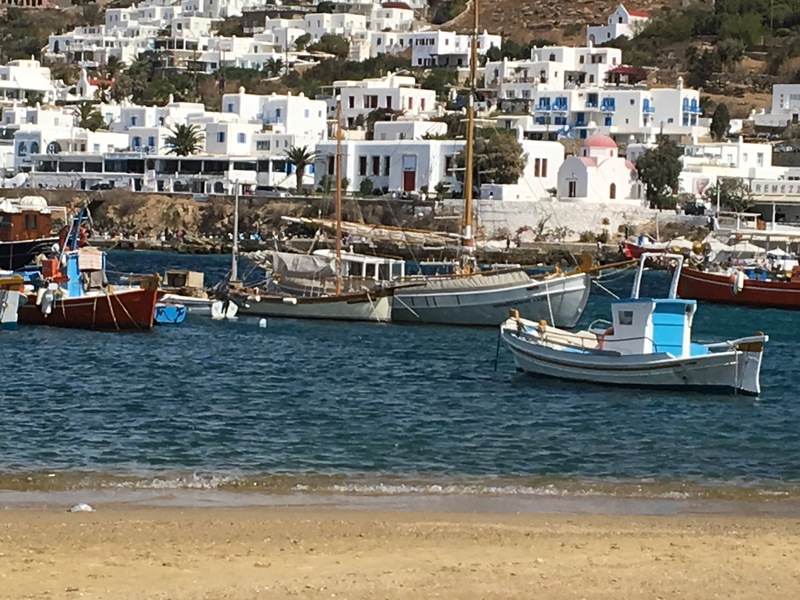 Mykonos occupies an arid and rocky 26 square mile swath of crystal turquoise Aegean Sea and is one of the Cyclades, a “circle” of Islands south of Athens and mainland Greece. If it weren’t for its beaches and scenic mountainside views, tourism may have never elevated the historically impoverished island to the posh, party destination it is today. Upon arrival, my first observations were the remarkably dry and rocky terrain, the humble whitewashed stucco houses with minimal attempt at landscaping or gardening. I compare that to Lima, Peru, which is essentially a coastal desert but has been tamed through irrigation with an almost lush covering of tropical plants and Palm trees. Most of Mykonos, in contrast, is scrub grass or just Martian looking orange rock, swept by millions of years of brutal north winds. 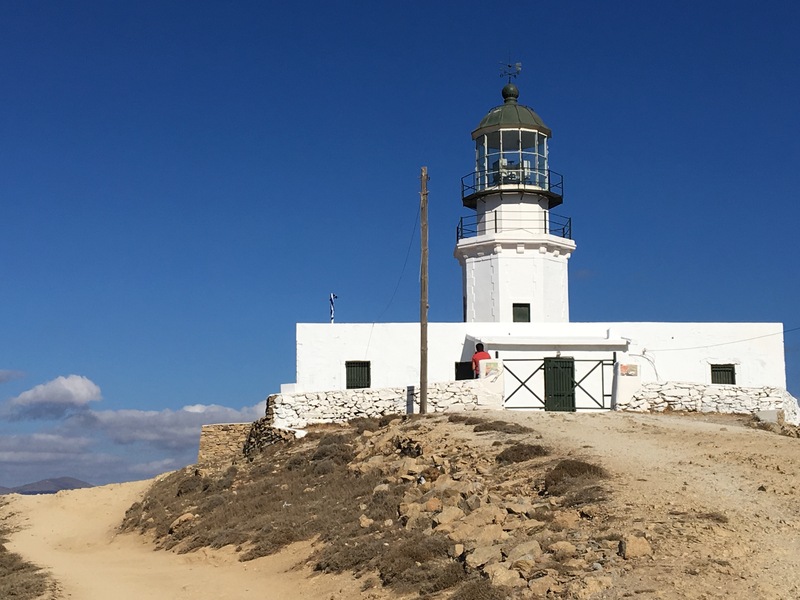 Mykonos has long, dry and windy summers and winters with occasional periods of range. If you visit around Easter, I’m told, you will see flowers and greenery. That’s not the case in September. 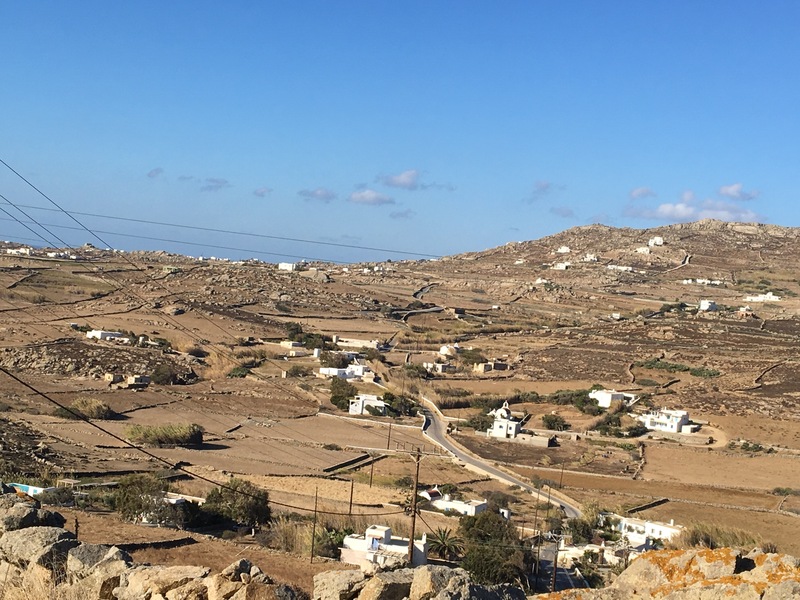 Natives of Mykonos say that the island has seen greener days, and archaeological evidence shows farming was somewhat easier two thousand years ago. But once you see Mykonos town or drive to several points on the coast, the striking, otherworldly landscape becomes a thing of beauty. Building code in Mykonos is quite strict. All buildings’ exteriors must either be painted white (and repainted yearly) or be made of natural stone. Window shutters and doors may be customized, but the buildings must be interconnected cubes or rectangles. Call it the ancient Stepford Wives’ precursor to suburban homeowners’ associations if you will, but the result is a traditional look that makes Mykonos feel unspoiled and unique. So what does all this mean for food and wine on the island? Agriculture has a historical precedence, but it’s not exactly a breadbasket. Grains and produce largely are imported from other islands or from the mainland in northern states like Peloponnesus. With such high winds, anything that grows can only do so low to the ground or root vegetables. Which makes its fauna better for grazing animals, and thus dairy is prevalent. 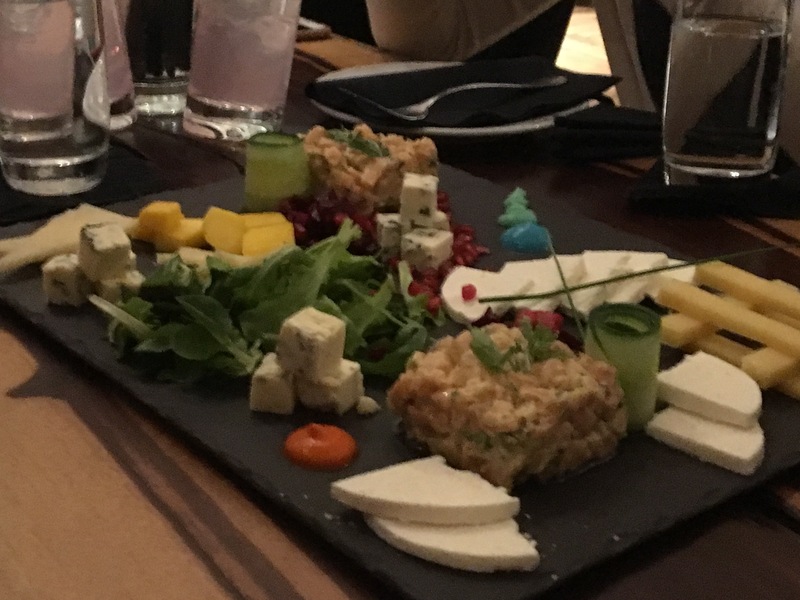 Mykonos is proud of its cow, goat, and sheep cheeses, which range from the fresh, soft Katiki which tastes like a sharper ricotta, or the very pungent, fungal Kopanisti Mykonou cheese, the latter of which even a stinky cheese lover like me could barely do more than two bites. And don’t forget Greece’s most internationally known staple: yogurt. Full-fat yogurt, thick like whipped cream, topped with Greek honey or unique marmalades (even a strangely caramel grape), is unparalleled. As one might imagine for an island, seafood is a staple: fish, octopus, and large prawns (langoustines) are everywhere. Grilled octopus, especially, can be found on almost any restaurant or taverna menu, and it is pretty fantastic! (This coming from someone who isn’t a huge fan of seafood). But what Mykonos lacks in internal agriculture, it more than makes up for by importing and using the best of its neighbors’ harvests. 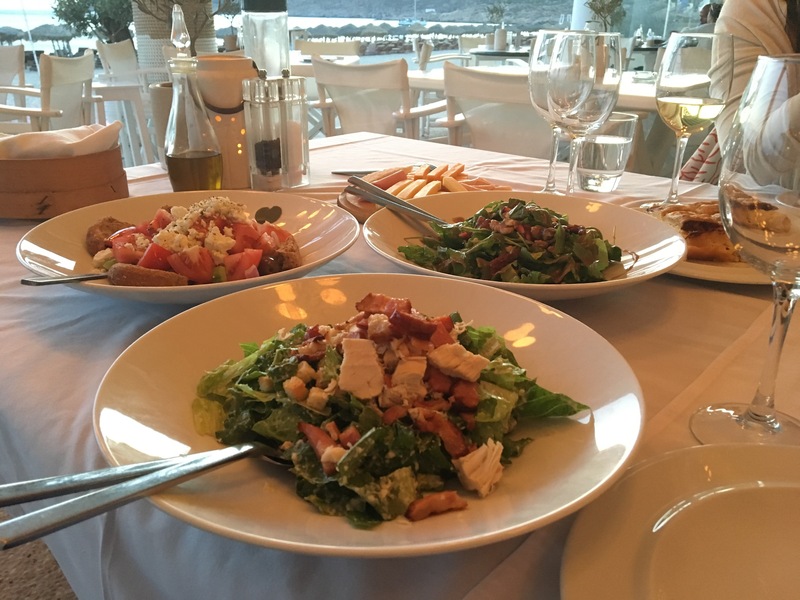 Mykonos proudly crafts dishes from all over Greece. 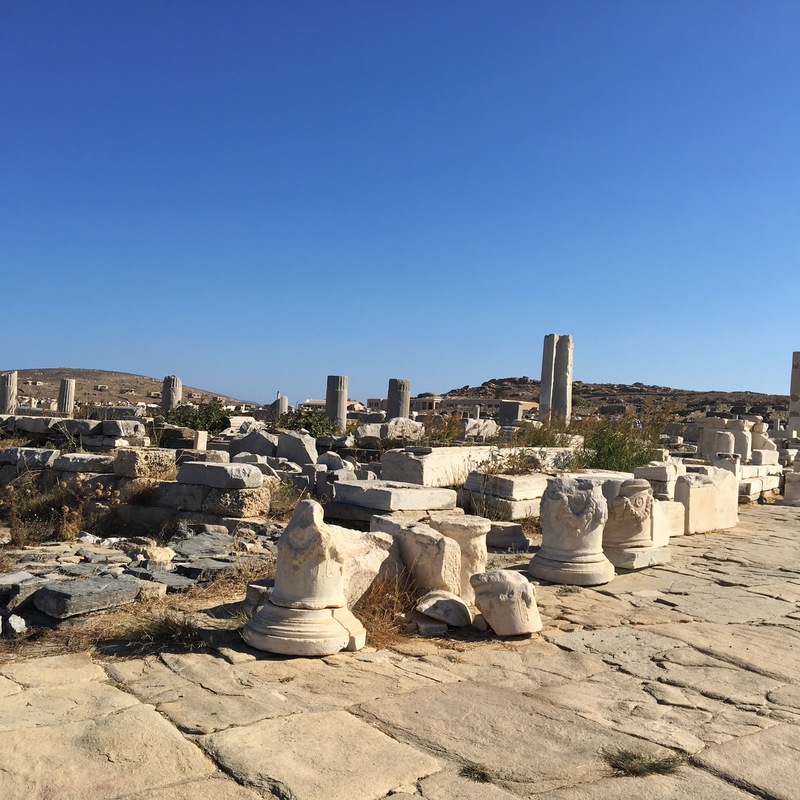 While the ancient Greeks pioneered international trade (Delos, a small island just west of Mykonos, was the first known duty free port, the Greeks claim), today’s Mykonos imports workers and tourists. Its roughly 200 day tourist season bolsters its year-round population of 5,000-10,000 to nearly 200,000 during peak season (July and August). Most seasonal workers live in Athens or other areas of the mainland during the winter, but others come from outside Greece. 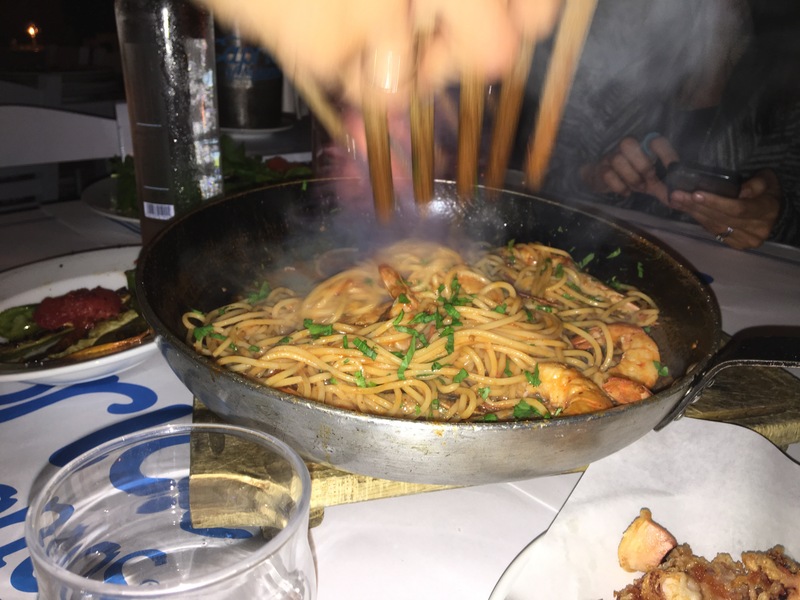 Despite the barrage of international imports, the majority of Myconian restaurants serve Greek cuisine with international fusion, rather than uniquely “ethnic” restaurants. So you’ll find sushi and risotto on many menus, but Japanese, Thai, Mexican, and Irish restaurants and bars are fewer than one might expect. Greek wine, also takes menu precedence over its more celebrated French, Italian, Spanish, or German neighbors’ exports. I personally worried a bit, having had a few not so great experiences with Greek wine in the past. My fears were mostly unfounded, as Greece now offers some really outstanding white wines and drinkable red ones. 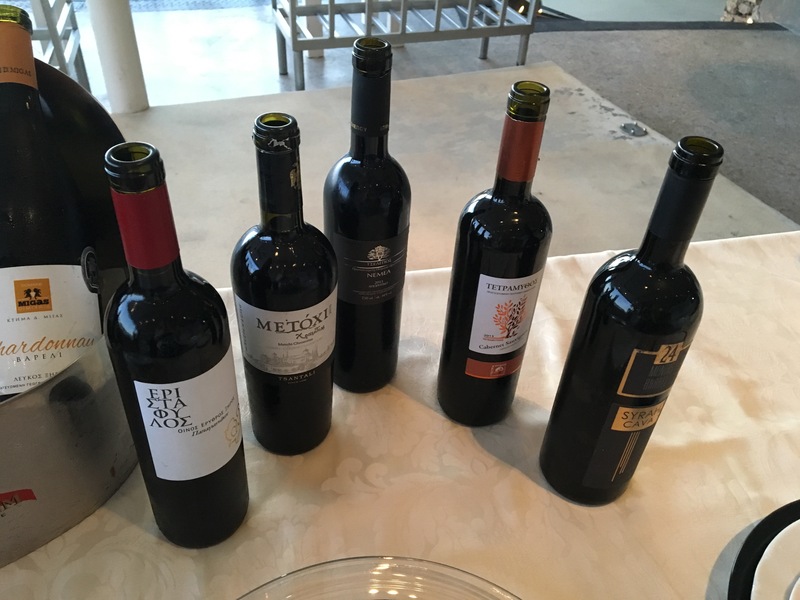 Let me explain what I mean by drinkable: demand for Greek wine has increased dramatically in recent years, so Greek producers release their wines fairly young. I was shocked to drink several 2015 red wines – and the harsh, young mouth on them could benefit from a bit more aging. More on this later! In next week’s post, I’ll share a primer on some of Greece’s best known – or uniquely Greek – dishes. From Greek salad to Tzatziki, Domatokefthedes to loukomades, you won’t want to miss it! I won’t need any convincing to dine on these foods. Delicious, beautiful & evocative. Yum.